I was doing science with my son the other day, and I discovered I have a new name to add to my list of titles: Rock Hound-a person who searches out and collects rocks. Yes, I am a lover of rocks! I am not exactly sure when this obsession began. I know even as a little girl you could search my underwear drawer and find a pile of rocks instead of clean underwear, which always made my mom really mad. I guess at this point I could try to get all spiritual and tell you my love of rocks has something to do with Jesus being the solid rock upon which I stand. This verse packs a whole lot of truth. However, I don’t think I thought about this much when I was a little girl. I simply don’t know why I love rocks. However, I do know one thing: Do not mess with my rocks! Everybody in my family knows the seriousness of this threat but apparently the girl next door didn’t know. You see, I was minding my own business one day while taking an inventory of my rock garden. Yes! my rock garden. Then, there it was…an empty imprint that gave an alarming clue that I had been robbed! With one hard stare at my young son, he quickly pointed a finger at “the girl”. He threw her under the bus with one swift kick. And this 7 years old girl and I were fixin’ to rumble. Picture the scene where the cowboy walks into the salon and everyone turns and gasps, the tumbleweed rolls by…It was very intense. I sent her home to retrieve my rock. She obviously didn’t get the neighborhood memo: Don’t mess with Mama Crosby’s rocks! Occasionally, I am accused by some family members of stealing rocks. I won’t even go there. That is crazy talk. In all seriousness, Isn’t our God amazing? He places these things in our life that bring us comfort and joy. 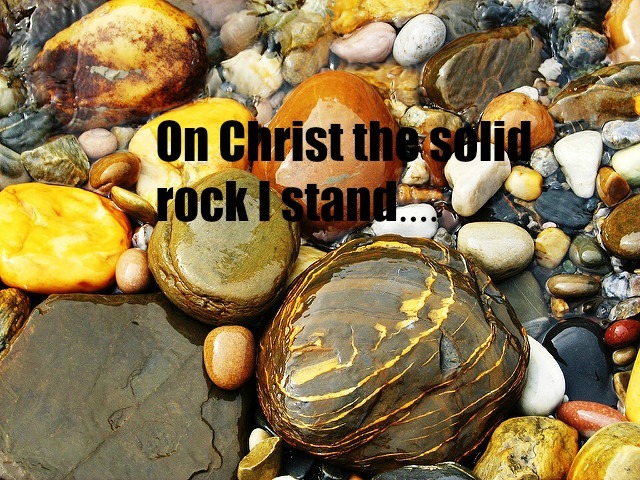 Maybe, just maybe, there was a time in my young life that I needed a solid rock on which to stand. I just didn’t know His name at the time. I look around me and I see the beauty of God’s creation. We are told in Romans 1:17 that all of creation speaks of God’s glory. I will just keep right on lovin’ me some rocks:) God is good! If you are wondering, No, I don’t talk to my rocks; however, I do like the feel of the smooth ones:) Don’t judge! Denise….you made me smile😃. I loved this!! Rock on, girlfriend!